The 2018 release of AutoCAD Map 3D contains customer-focused enhancements across the product, including the following specifics. 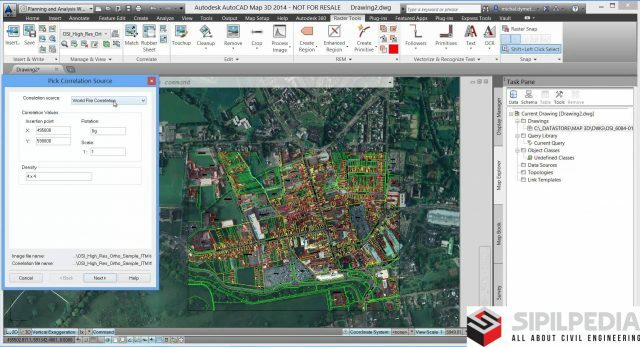 AutoCAD Map 3D 2018 has been enhanced to adapt to the higher display resolutions and pixel densities in Windows. Most user dialogs, palettes and toolbars should be displayed nicely on monitors of 4K and higher. AutoCAD Map 3D 2018 now supports the fourth generation MrSID files. You can add such files through FDO Raster provider, MAPIINSERT or ATTACH. The highest version of PostGIS that AutoCAD Map 3D 2018 can support is now 2.2. Map 3D 2018 can work very well with GIS data that is stored in PostGIS 2.2 installed on PostgreSQL 9.5. AutoCAD Map 3D 2018 supports WFS 2.0 protocol. A new option ‘2.0.0’ is added to the version drop-down in the FDO WFS Connection dialog. AutoCAD Map 3D 2018 has completely removed all features related to Ambercore point cloud. Users can no longer directly add LAS, and XYZ point cloud raw data to Map 3D. All the related entrances, including commands like MAPPOINTCLOUDMANAGER have been removed. Users with point cloud raw data in LAS and XYZ format should follow the new procedure: To Bring in Point Cloud Data. Extend the support of FDO ArcGIS Provider to versions 10.3.1 and 10.4. – Digitizing a feature will encounter some error if the corresponding layer has defined a query including the non-standard functions like TB_VARIABLE. – Promoting a job from Pending to LIVE in Industry Model is slow. – Map GIS Overlay – wrong result with Intersect type. – The expression for Font Size in Style Editor doesn’t change correctly according to the input. – SHP files with M value in geometry, or Vertex has an M Value, does not reproject coordinates. – Command MAPTOACAD exports the wrong color for symbols. – Clicking “Zoom Extents” button in Map Search dialog causes an Unhandled Exception. – Using csupdate.exe to add user defined CS does not succeed. – Map 3D doesn’t work when repairing the existing Raster Image or Surface connection. – Map 3D stops working when using MAPTOACAD with industry model drawings on Win8.1 and Win10. – Map 3D stops working when running command ADEEDITDATA and selecting a polygon in some drawing. – Info Center is still shown when the corresponding registry entry is set to 0. – Map 3D cannot connect to some particular WMS servers. – Filter saved in display model doesn’t work when generating graphics with this display model. – Working with structure internal in Electric Explorer may cause Map 3D to stop working. – Map 3D freezes when using MAPIMPORT or MAPEXPORT with some SHP files. – Definition of Coordinate System CSRS.UTM-10N is wrong.